Check out the photo below. 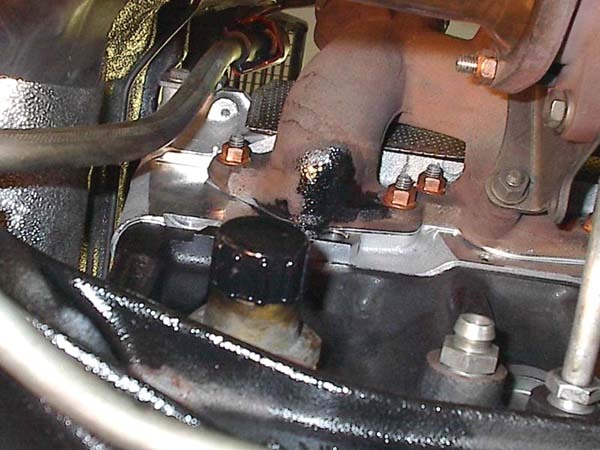 Yes, that oil leak is coming from the exhaust port, not the cylinder head. I cleaned the area with solvent & a rag, started the car, and watched the oil slowly appear at the base of the manifold/gasket area. A small air bubble would appear periodically as well. The quantity of the leak is enough that it drips all the way down the block and leaves a 1-2 inch spot under the car wherever I park. Now, here's the bizarre part. I just put on a new cylinder head. This started after the new head went on. Oil consumption before the new head was about 1 quart per 7500 miles (basically nil). I've only driven ~500 miles with the new head but the oil level doesn't seem to have moved (i.e., still very low oil consumption). So I don't think the engine is conusming very much oil. The leak is more annoying due to the odor than the drip. The smell of burning diesel oil is quite pungent - much different than burning oil (on an exhaust manifold) from a gas engine! The old head had the rearmost stud broken off at the same port, and was leaking exhaust - there was a DRY carbon trail as proof. So, prior to the head job, there was no oil present there. From inspecting the old head, NO, the stud does not enter an oil passage, and the oil is not from a leak past the stud threads. The studs were pre-installed in the head from Mercedes. I used a Mercedes gasket kit from the dealer. I think it's possible (likely?) that the old leak warped the manifold, so it's not sealing quite right. However, before it was a "dry" leak, now it's wet. What I don't get is how oil can be present at this point. If it were entering the intake, it would burn, right? I wouldn't get liquid oil, I'd get blue fumes. The valve seals are new, and the machine shop swapped over the old valves after checking them all out. Besides, with a turbo, there is little to no vacuum to pull oil past the seals. There is oil in the intake crossover pipe and main charge pipe, more than I think is normal. It has to be coming from either the PCV (vent tube fro valve cover) or the turbo shaft oil seals. There's no other entry point upstream. I have the EGR valve disconnected. If the leak was due to oil coming through the intake, why wouldn't it appear at the other ports? OK, maybe because they're all sealed properly, and the oil is staying inside the manifold. But wouldn't I get a constant cloud of blue smoke out the tailpipe? And high oil consumption? Ditto if it was blowby. Compression is above minimim spec, btw, at 26-28 bar. The turbo is the same as before the head job, and the blowby shouldn't have changed with the head job either. If either was the source I should have had liquid present at that port with the old head. The valve seals don't make sense either. I'm really stumped on this one. I won't have time to pull the exhaust manifold off for months to inspect further. I just wish I could figure out how this is happening. I'm going to pull the breather tube out of the intake elbow, and plumb it into a bottle or something, to eliminate that source. If oil is still present in the intake plumbing it would have to be from the turbo (KKK, no external leaks). I get minimal smoke visible when driving or at idle. I did notice that when I rev the engine to ~3k when warm, there is noticeable (blue?) smoke. Also, once when I left a stoplight after 1-2 minutes of idling, the car left a cloud of blue smoke. But normally there isn't much there. And oil consumption (Delvac-1) is still extremely low. Last edited by gsxr; 05-01-2002 at 04:41 PM. I can not think of any reason why you should be leaking oil out of the exhaust manifold. You are right, everything would just burn up if any oil was in the exhaust gas. So look for another problem. See if the oil is being blown onto the manifold. You have an exhaust leak. If the oil is deposited there, the oil bubble would form like you described. when i did the head on my car, I had the exhaust manifold decked because it was leaking. The shop set it is very common to have a warped manifold after a exhaust leak. You may have to remove the manifold if you want to fix the exhaust leak. Look around for an oil leak elsewhere. make you a bet that it is coming from somewhere else and being blown onto the manifold. I have a 300SDL with the same engine you have. Assuming my assumption is correct, I think I may know why the engine is leaking oil onto the exhaust manifold. Now this is where I have to make an assumption because I haven't lifted my car for a while to look underneath at the same area you have on your engine. If you look at the picture you took, you will see a circular area just to the right of where the leak starts. That circular area looks suspiciously like a small freeze plug. My engine has a freeze plug similar to that but there is one located at the very back of the head and it is slowly leaking on my engine. Theory: if that is a freeze plug on your engine blocking engine oil, it is leaking slowly onto the exhaust manifold. Since the exhaust manifold gasket isn't sealing perfectly, it is giving the illusion that the oil leak is coming from the exhaust port because of a very small exhaust leak which is causing small bubbles into the leaking oil you are seeing. If my theory is correct, the solution is obvious by replacing the freeze plug but that is alot of work just to remove the exhaust system to do that. A short cut would be to apply JB Weld to that area; I see no reason you would ever have to need a freeze plug for oil in that area anyway. Other than my theory, I can't think of what else it could be because you have already had the new head checked for cracks and there should be none. My .02 cents. Henry, I wish it were coming from somewhere else. This was a new head, and while it was off the car I cleaned EVERYTHING in the area, totally bone-dry. This leak is actually coming from the exhaust port. I wiped it down (after taking the photo above) so it was all clean again, before I started the car and watched it come from the manifold and drip down to the block. Now, had I checked the manifold sealing surface, it probably was not flat and should have been decked by the machine shop. And if I had done that, the oil would remain in the exhaust system and not drip out. I thought it was blowing up there too, but it's not. Herb, that's a good theory... except there is no oil present on top of the exhaust port. If the plug was leaking, it would leak on top first and then down to the bottom. I think those aren't "freeze" plugs, they are holes required for the casting process (?) that are then filled with the plugs. I'm not sure, that's just a guess... the holes go into the cam/oil galley return area, not coolant, IIRC. Your right about the freeze plugs, they go into the valve area and are only under crankcase pressure. Well, being that the oil is coming from no other location that the exhaust manifold, How does it get there or is it risidual oil from your cleaning of components. Did you use anything on the inside of the exhaust manifold? Maybe what you are seeing is goo that formed when you cleaned the manifold and it is oozing out. Does it feel and smell like oil? I think you are going to have to take the exhasut manifold off to fix the leak and have your manifold decked. It will not get any better and it will only get worse. At that time you can inspect the mating surface and see if the head casting could have had an inclusion or other adnormality. Let me know how it works out. Well, if all other possibilities have been eliminated, the obvious remaining answer must be true--the oil must be coming from the exhaust port area... somehow. Perhaps there is an error in the casting, and somehow the holes for the studs penetrate an oil supply or return line in the head. What happens if you temporarily remove one of the studs and operate the engine--does oil gush out? Do you have a good set of stud-extractors? Could you have a bad injector, causing poor combustion on that cylinder? Low compression will also cause "wet stacking"-- unburned fuel in the exhaust. You will have running problems with either condition. Turbo leaks will show up as oil in the intake or blue exhaust smoke -- no way oil is going all the way up THAT exhaust manifold! I suppose you could have a turbo leak large enough to get oil all the way through the engine at idle, but you would have high oil consumption, too! I'm curious, as a oil leak large enough to leave drips on the drive is about a quart in a thousand miles or more oil consumption -- you would have noticed it by now. However, I have seen diesel tractors "weep" "oil" that is actually the heavy end of diesel fuel, leaking past bad injector seals and oozing out around the injector. Don't remember any oil in the exhaust, though! The only other way for oil to get there is for there to be a leak between the oil gallery in the head and the exhaust port (i.e. a defective head). The injectors are freshly rebuilt. No other running problems - starts instantly, smooth idle, good power (well, it's a little soft off idle, but otherwise strong). There is a hint of blue smoke when you rev it at idle, and the blue cloud I mentioned when leaving a long stoplight, but that's it. Oil consumption is still pretty low. I know the turbo seal leak would have to be into the intake (I do have quite a bit of oil in the intake charge pipes), but again, consumption is pretty low. How about a bad or missing valve stem seal on the exhaust valve? Oil could leak down the guide and get blown out of the head on each exhaust stroke. You would need to pull the valve cover and then remove the valve spring and such to test, but better than pulling the head or even the exhaust manifold to see what is going on. I wonder how much play is in the valve guide. Blue puff of smoke after extended idling is diagnostic for bad valve guide seals/valve guides. The other possibility is that the seals were damaged during installation, or not seated properly on the head, allowing oil to leak down. Don't have any other ideas, alas! Luckily I happen to have a disassembled 603 engine in my garage. After looking at your excellent pictures and reading the replies to your post, I agree that the most likely source for your oil leak is from a bad valve seal or guide or combination of the two. You are right that it isn't coming from an external source--you would either see it, or it would be spraying under pressure. In thinking of a simple way to see fur sure, I came up with an idea that might work. Sop up amy oil in the valve spring area around the exhaust valve in question. Blow it out if you can't reach it due to the spring. Spray a liberal amount of a very light weight oil directly on yhe valve stem and seal (penetrating oil or such). make sure it isnt some liquid that will damage anything. Look under the exhaust manifold and see if it comes out. Since none of the rest of the engine will be receiving oil, this will be your culprit if the penetrating oil leaks out. I'll put my theory to test tonight in the garage. I'll put a valve back up the guide to see if the oil runs down and pools right where the exhaust manifold meets the bottom of the port. I noticed the smoke puff was much worse after idling for a while at a stop light. So today when I got home, engine nice and hot, I let it idle for several minutes. I then stomped on the accelerator and let off (let it rev to ~3k then back to idle). There was a BIG blue cloud that reeked of burning diesel oil. Revving it a second time (or 3rd or 4th), without idling, produced minimal smoke. Then I let it idle a few minutes, repeated the revving, and got another big cloud. So it seems that at idle, oil is building up *somewhere* and then burns out in a cloud under load. At full throttle the smoke is minimal, or at least not very noticeable in the mirrors. Ditto when cruising. 2- Turbo oil shaft seal: The oil pressure would be fairly high even at idle (~2 bar hot), producing the same leak rate as under load. (?) I guess it could be puddling up in the intake side, and then when the engine revs, it gets sucked in and burned. The reason I think this is NOT it, is that I didn't have this problem before the head replacement, and I didn't mess with the turbo while the head was off. 3- Valve seals: Aren't the symptoms described above a classic case of bad valve seals? It might even explain that oil leak out the exhaust (which is mostly because the gasket didn't seal, probably warped manifold). But the valve seals were brand new on a new head & new guides! What could have gone wrong?? The only way you can diagnose this problem is to do exactly what you don't want to do. Remove the manifold assembly and check the condition of the port. If there is oil in the port, it could very well be a valve guide seal, and somehow oil is able to seep between the head and manifold (very iffy). This is true *as long as* all external topside oil leaks are eliminated AND you are sure the head casting is not defective. Seems like you're going to have to tear into it one way or another... don't worry, we're here! If you need to bounce some ideas in mid-teardown, I'm sure everyone will be willing to offer some advice! So, that means the oil leak coming from the head, not the intake. The "thumb" test is useless on this car - there's almost zero airflow from the valve cover hole, I could hold my thumb over it all day and just get a burned thumb, the engine would never shut down. I don't think there is much blowby, and I'm presuming minimal oil passing the rings. It has to be coming from either the valve seals or a pressurized oil passage. Now, the only area of the head gasket that has a *pressurized* oil passage is right up front, between cyl #1 and the timing chain area. Every other passage is a drain (no pressure). There is a plug in the exhaust manifold by cyl #1, I pulled it out to inspect, it was bone dry and carboned up - i.e., normal. I stuck a Q-tip down the hole, wiggled it, still dry - no sign of oil. So, it appears that I either have a problem with cyl #6, and possible some other cylinders, but #1 might be OK. Have to yank the exhaust to find out (ugh - not doing that for a while.) I can also look at the valve seals to see if they put them in backwards on one cylinder. This requires pulling the cam, not as bad a job as the manifold would be. I might try that first.